When a new bridge is built to connect Pensacola to Gulf Breeze, it likely will be in about the same place as the existing, 51-year-old span. And that's just fine with Gulf Breeze City Manager Edwin "Buz" Eddy — a departure from the city's previous position. "Back in 2002 and 2004, the city wanted the state to consider a more comprehensive look at the circulation of traffic from Escambia to Santa Rosa," Eddy said. "But we recognize there really isn't time to do that type of analysis, and we recognize how important U.S. 98 is to the businesses along the highway." Eddy was among about 150 people at the first public meeting last week to discuss an effort by the state Department of Transportation to replace the bridge, with construction starting in as soon as 2016. More meetings are expected in both Pensacola and Gulf Breeze. The existing bridge is safe, according to DOT spokesman Tommie Speights. But it has been deemed "structurally deficient" because of cracks in the road surface, rust in steel components and deterioration to pilings. The new bridge, estimated to cost $200 million to $330 million, may be shifted slightly to the east or west, Speights said. The project development and environmental study phase of the effort — including the final positioning and construction schedule — should be done by June 2013. Gena Buchanan, a Pensacola resident and secretary of the Scenic Highway Foundation, is glad the state plans to keep the bridge where it is. Earlier ideas included the possibility of moving the bridge's northern landing to Scenic Highway, potentially increasing traffic on Scenic Highway. She also praised plans to include pedestrian and bike lanes on the new span. A west side bypass again is one of the recommendations made by a consultant studying the city’s traffic needs. The Renaissance Planning Group presented the proposal during a recent meeting of the Crestview Area Chamber of Commerce’s government issues committee. The bypass is needed to relieve growing traffic congestion on State Road 85, said Whit Blanton, Renaissance’s vice president and director of transportation planning. Overall, Renaissance’s research found there is a sufficient road network to support growth in and around Crestview, although SR 85 is reaching capacity and actually is already over capacity from downtown south. Renaissance is focusing on a western bypass network using P.J. Adams Parkway, Antioch Road, Arena Road and Old Bethel Road. To avoid what he called a “pinch point,” at least one more interchange on Interstate 10 is needed, preferably at Antioch Road. Business leaders were worried that a bypass would hurt downtown businesses. “We don’t want a bypass totally through Crestview because we don’t want our Highway 85 businesses to suffer,” chamber President Derek Lott said. While those at the meeting generally responded favorably to Renaissance’s strategies, funding was a concern. “All these are great plans, and planning is important, but there is no money,” County Commissioner Wayne Harris said. Creating the P.J. Adams Parkway corridor alone would cost between $100 and $150 million, he said. Local funding sources could come from an increased gas tax, a Municipal Service Benefit Unit (MSBU) or user fees, “none of which I want to see us get into,” Harris said. To go after federal funds, Blanton said, the final plan must lay out as many benefits as possible, such as community livability, access to schools and emergency access to military facilities. Impact fees, developer contributions, regional transportation funds and grant funds form the bulk of local and state funding possibilities. Blanton cautioned against being too aggressive with impact fees, which is a touchy subject in Crestview. “You don’t want to scare anyone off,” he said. Renaissance works closely with the Okaloosa-Walton Transportation Planning Organization and is involved in the Tri-County Growth Management Plan, Blanton said. When completed and accepted by the city, the consultant’s proposals will go to the Florida Department of Transportation. RE: Ex-SR 290 and (Future?) SR 750...SR 290 was given to the county, while Airport Blvd (not listed as SR 750 in the SHS Add/Deletion list for the first part of this year) was given to the state on June 30th. Recent data show it will take Walton County residents anywhere from 24 to 48 hours to evacuate ahead of a hurricane. County commissioners are continuing to lobby for federal funding to widen U.S. Highway 331, which has given the county the worst evacuation time in the state. The cost to widen U.S. 331 from the bridge north to Freeport is estimated at $294.5 million. Representatives from the state Department of Transportation presented their plan to resurface a 3-mile stretch of State Road 20 at a meeting Thursday night. The nearly $3.4 million project will begin at Roberts Drive and stretch east to the Walton County Line, excluding the section of road already resurfaced in the Mid-Bay Bridge Connector project. Planned improvements include resurfacing existing lanes and shoulders, redrawing lane lines and installing some new curb ramps to meet standards of the Americans with Disabilities Act, said Janet Middleton, a consultant for the DOT. The last resurfacing on SR 20 was completed in the late 1990s when the road was widened to four lanes, Middleton said. Roads generally have a design life of 14 to 20 years, she said. “It needs to be restored so it has a longer surface life,” she said. At one point the DOT sought funding to extend the north sidewalk from Range Road west past the entrance to Fred Gannon Rocky Bayou State Park, Middleton said. That improvement is not included in the plans at this time. Plans should be finalized by the end of this year and the project should begin by the end of 2013, she said. Turnout was low at the meeting at the Niceville Community Center, but several City Council members came to review the plans. Only about 200 yards of the project are actually within city limits, said Councilman Heath Rominger. “But I think it will help ease some of the traffic through town that people complain about,” he said. Councilman Bill Smith said drivers notice ruts in the road, especially after heavy rain when water collects in the right lanes. The DOT provided a large map of the project, which it planned to leave at the Community Center for future viewing. Drove Florida 750 on Saturday during T.S. Lee. In addition to the shield added after SR 289 (9th Avenue), a second westbound shield was added after SR 291 (Davis Highway). There was at least one eastbound shield posted beyond Davis Highway, but no other signage westward at either Interstate 110 or US 29. Returned east via SR 290/CR 290. 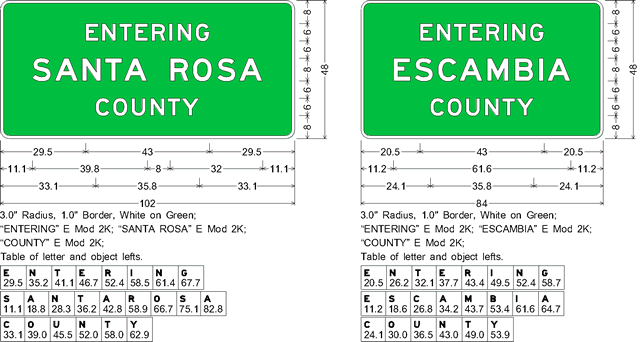 Eastbound there are no reassurance shields until after SR 291, and only two posted total for that direction. Westbound shields are only posted after SR 289 and 291 as well. Noted a new traffic signal at Cody Lane. I think the installation of this signal may have been contingent that the road be under county maintenance based upon an article I read about it several months ago. WOW! A normal route shield in Pensacola? Someone has got to notify District 3 asap because it needs to be replaced with a popcorn shield. Did they remove the SR 290 shields from CR 95A? Residents will be able to take a look next week at plans to widen State Road 123 to four lanes. The Florida Department of Transportation in cooperation with Eglin Air Force Base will host a public hearing on the proposed project from 5 to 6 p.m. Thursday at the Niceville Community Center at 204 N. Partin Drive. A formal presentation will be at 5:30 p.m. The work will widen SR 123 from two to four lanes with 10-foot shoulders and a 64-foot grass median. In addition, new two-lane parallel bridges over Tom’s Creek, Turkey Creek, and a tributary of Turkey Creek are being proposed. The article does not mention it, but a part of the project will include the construction of a "Y" interchange at the north end of State Road 123 with State Road 85, thus eliminating the bottleneck at that end of the state road. I'm happy to see this project! And while we're at it, whynot renumber 123 to be 85bypass and the current 85 routing be 85business??? ok, now we need a Crestview bypass of 85 from Antioch Rd area to CHS area?? Well, when we traveled on it today there were two land survey companies working today in the proposed project area (one company at the north end, one company at the other end), so I know that they are already performing topographic surveys in preparation for the project. It would have been nice to not have seen the two sets of turn lanes and median crossings for the cell towers though. IMO, they should really be constructing this as a limited access freeway all the way up to Interstate 10 near Crestview (given that the last few miles would need to be on new alignment). NAVARRE — Work to widen a three-mile stretch of State Road 87 in Santa Rosa County has reached the halfway point and is expected to be completed next fall. The current project will widen SR 87 from two to four lanes from Five Forks Road north to the southern edge of Eglin Air Force Base property. Construction started in late August 2010. Crews for Anderson Columbia are laying the new lanes now, Speights said. When that is completed, they will switch traffic to the new lanes and redo the existing lanes. Those lanes will have to be torn out and new asphalt put down. The current three-mile project is budgeted at $15 million. It was funded by President Obama’s American Recovery and Reinvestment Act, better known as the stimulus bill. The work is expected to be completed in October 2012. Two more phases are planned to complete the widening project. They will cover about 10 miles between Hickory Hammock Road and the Eglin boundary. Funding for the final two phases has not been budgeted and neither phase is in the DOT’s five-year work program. Total construction cost for those phases is estimated at $57.7 million, Speights said. What?? Yes, I agree some of the new northbound lanes have been paved, but they are only paved to the abutment of the bridge over the creek, and they haven't even begun construction of that yet!! And not a whole lot has been done north of that point to the end of construction so a lot of work (staking, grading, etc., etc.) will have to be done before that can even be paved!! And are they going to rebuild the existing bridge?? If they don't then the northbound bridge will be extremely higher than the southbound one. So the rest of the four-laning of FL 87 south of I-10 probably will not be completed until sometime after 2025 (my guess here)? IMO, every north-south corridor in this part of Florida should have been built up to divided highway status by now. I can only imagine the gridlock hell if (and/or when) a major tropical system slams the coastal area here. It will be like sucking a walnut through a straw. Sorry about the slight tangent about Eglin (and their bombing), but it really gets on my nerves that they are able to ship all these military personnel to this area and they do not even care on how that affects the transportation system (or lack thereof) around here, nor do they seem to be concerned to do anything about it. The routine congestion near U.S. Highway 98 and Hurlburt Field’s main gate worsens anytime there’s a wreck, and there are about 20 each year. Now, a proposed road project aims to reduce both frustrations. The Florida Department of Transportation project would reconstruct the intersection of Cody Avenue and U.S. Highway 98. Okaloosa County Commissioner Don Amunds said the estimated $21 million project has been in the works since 2002. The Florida Department of Transportation (FDOT) will hold a public hearing on the proposed overpass. The Nov. 1 hearing will be at the Ramada Plaza Beach Resort (1500 Miracle Strip Parkway SE) in the Ambassador Room at 5 p.m. with a formal presentation at 5:30 p.m.
Looks like another two to three years for design and two more years to construct the SPUI, which is the primary alternative for this project. Found two remaining shields for the 2006-decommissioned U.S. 98 Alternate at Panama City Beach. There was no good angle to view this shield due to the palm frondes. I saw the backside of it from SR 30 and we turned around and I stood outside to try to document it. It is on a dead 3000-series County Road. According to my Mapsource Bay County, atlas, this was County Road 30P. It is not a county road now, but this shield remains. Probably was a 90s error install as it had a yellow FDOT sticker on the back. State transportation officials will host a public hearing Tuesday to present plans for an overpass on U.S. Highway 98 at Hurlburt Field’s main gate on Cody Avenue. The hearing will be from 5 to 6 p.m. in the Ambassador Room at the Ramada Plaza Beach Resort on Okaloosa Island. Visitors can review the proposed design, ask questions and submit comments on the proposal. Representatives with the Department of Transportation will make a formal presentation at 5:30 p.m. The project is intended to relieve congestion and improve safety near Hurlburt’s gate. It calls for building two two-lane bridges on U.S. 98 over Cody Avenue with ramps to and from Cody. The job will extend about 3,350 feet west of the intersection and 2,500 feet to the east. Okaloosa County Commissioner Don Amunds has estimated the project will cost $21 million. Funding sources have not been finalized. Okaloosa County and Hurlburt Field have approved an Environmental Assessment and a Finding of No Significant Impact for the project. Walton County commissioners will break ground Tuesday at 9:30 a.m. to mark the start of improvements to a small stretch of U.S. Highway 331. The project consists of 1.6 miles on U.S. Highway 331 from Owl’s Head Farm to .85 miles north of Bill Brown Road in Freeport. The $8.6 million project is scheduled for completion in early 2013. It is being funded through state and federal grants through the Department of Transportation with a $2.7 million commitment from Walton County. Schematic of the potential SPUI. Thanks in part to yours truly, the Escambia and Santa Rosa County line will be signed on the Escambia Bay Bridges of Interstate 10 again. Received an email last week with the Traffic Operations Request Evaluation/ Recommendation form and sign specs for the new assemblies. Stumbled across this project tonight while looking at other things. FDOT plans to widen a 2.7-mile stretch of Interstate 10 from SR 291 (Davis Highway) to the Escambia Bay Bridges. This includes a redesign of the Exit 17 folded-diamond interchange with US 90 (Scenic Highway) and replacement of its overpass. The widening will see I-10 six-laned from the east end of the Escambia Bay Bridges to just east of US 29 (Exit 10). When will construction begin and how long will it take to complete the work? The design will be completed in early 2012. The current project letting date is August 2013. The contract time for the project has not been set but it is anticipated to take approximately two years to construct. I seriously hope whatever traffic engineering study they conduct after this construction will say to up the speed limit from 55 to 70! With light traffic, 70, or at the very least 65 seems very reasonable for that stretch of I-10. apparently, the 55 has to do with an older interchange configuration (US-29, if I recall correctly) there that was prone to weaving and large speed differentials ... but since the interchange was rebuilt, indeed the speed limit should likely be at least 65. and FHP should get out of the revenue harvesting business there. I can see that, especially now with US 29 having left-hand entry ramps onto I-10 in both directions. Not exactly the best situation for merging, but this exact same setup also exists with I-10 and I-75 about 300 miles east. I believe the speed limit remains 70 for the latter. And for upping the speed limit for those "abandoned stretches" - tell me about it. Madison County Sheriff's Office is not on my good side. Work continues on the SR 85/SR 123 interchange with the majority of the work now focused on the airport entrance flyover (for northbound and southbound SR 85). The steel beams for SR 123 northbound traffic will not be seen until February though. The entire project will be finished in Fall 2012. Is it a common practice in Florida for county sheriffs to run radar on a Interstate highway? My home county, Okaloosa county, doesnt run radar even on local roads iirc.